Okay, I have to tell you this was one of the highlights of our trip to Florida! I have been to Walt Disney World Orlando before, but the last time I went was at least 12 years ago, maybe even 15. So needless to say, I was excited about being able to visit again, and see some of the things I remember as a child, and also all the many new rides and attractions. Walt Disney World provided C and myself with a 1-day Park Hopper pass. We started off the day by visiting Hollywood Studios, as I remembered a couple parts of that particular park that I was very anxious to revisit. I'm not big into movies, but nevertheless, I really enjoyed the few hours I was able to wander Hollywood Studios! My first stop was at the Tower of Terror (I remember riding this multiple times with my Dad when I was about 11 or 12). The line was pretty long, so I took advantage of the FastPass option, and received a ticket to come back about an hour later. We decided to wander back and see if the Backlot Tour was still running (hey, after 12 years I thought maybe some of the rides and tours might have been replaced by different ones). I was very glad to see that it was still there, and we were able to start our tour after only a 15 minute wait. I absolutely love this tour, being able to see some of the behind-the-scenes details on how they shoot certain movies! I didn't remember the Harbor Attack part, which shows how water scenes are shot. This was really neat to watch! We proceeded through a museum of sorts, and then took our seats on a tram for the rest of the tour. As you wend your way through this area of the park, you will be greeted by familiar pieces from movies. Of course one of my personal favorites is Herbie! The Backlot Tour also takes you through Catastrophe Canyon. As you cross the rickety bridge, several eventful things take place. First the ground starts shaking, then fire shoots out from the old tanker truck sitting nearby. Just when you think it's as bad as it can get, water gushes down the mountainside, splashing those sitting near the edge. Again, super fun to experience! After leaving the Backlot Tour, we wandered through the Pixar area of Hollywood Studios. This is a really fun area for both children and adults, and features quite a few Toy Story themed stores and attractions. Next up, the Streets of America! I was honestly astounded at just how realistic these facades look. Using a special technique, you will actually think you're in New York City or San Francisco as you view this! By this time I was due back at the Tower of Terror, so we headed back that way. With the FastPass it only took about 10 minutes to get started, and wandering through the creepy-looking old hotel as I made my way to the elevator...not for the easily scared! The ride was just as fun as I remembered, with the heart-stopping drops, all in the pitch dark making it even more exciting. Definitely not a ride you want to miss if you ever go to Hollywood Studios! When I exited Tower of Terror, we had just enough time to make it to the main attraction (for me) at Hollywood Studios-the Indiana Jones Epic Stunt Spectacular! I remember seeing this as a kid, and being so enthralled by the stunt men performing various tricks and routines. Their balance, skill, coordination, and the ease with which they perform is amazing. Oh, and the story is pretty fun too! :) We showed up early and were able to get front row seats, which was great. If you have never seen this, you have got to visit. It is so fun! E and M seemed to think the best part was when "Marion" demonstrated some punches, using one of the "extras" that had volunteered from the audience. Of course, this is really one of the stunt men, but the kids thought it was hilarious! Unfortunately because of the rain, they were only able to do the first 2 parts of the show, but that didn't stop us from enjoying every moment of it. Here's a couple pictures and a short video clip so you can see for yourself just how exciting this is. 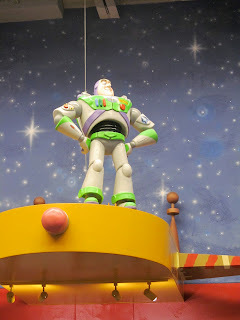 Before heading out and over to Magic Kingdom (that will be part 2) we stopped for lunch at Pizza Planet! If you're familiar with Toy Story, then you know what this is, and we were super excited to actually be eating at Pizza Planet! The atmosphere is very fun, and styled very much around Pizza Planet from Toy Story. Check back next week for details about our visit to Magic Kingdom!